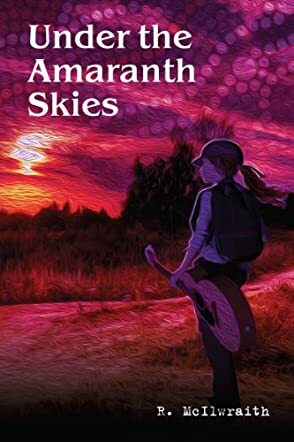 R. McIlwraith’s fantasy novel, Under the Amaranth Skies, is a journey into legend, into the heartland of West Australia and into the self. The reader takes this journey with sixteen-year-old Jasmine McGregor, a lovely, lithe, and lone figure who walks a desolate road. With her guitar on her back and music in her heart, she knows not where the road leads, but the way lies forward. Bob, a kind traveler, is her purveyor to Bartlow where she finds employment in an apple orchard. Jasmine, fleeing an abusive past, does not recognize love when fellow workers, ‘The Trio’ (Old Farley, Jim and Keith) and young Johnny, offer her genuine love, affection, and community. She feels people are inherently evil and this realization consumes her. In addition, the sultry blues linger heavy on her heart. She is tired of the burden of living, of intense pain, and of not belonging. A hard worker, Jasmine leaves the orchard under unfortunate circumstances, finding herself back on the road except this time she is driving her green car, “Kermit.” She doesn't know it yet, but she is propelled forward by a prophecy that must be fulfilled. The spirits of the Dreamtime sing a melancholic lullaby of sisters, one black, the other white, the Givers of Light and the slayers of the serpent. Their mission is to “remove the veil of ignorance that is descending upon the Earth.” Do Jasmine and this swarthy sister have what it takes to wage war in the underworld? This novel is a tapestry of magic. R. McIlwraith’s Under the Amaranth Skies is poetry in prose. A wonderful storyteller, the author keeps you turning pages. Jasmine “Jazzy” McGregor is the epitome of the blues, even acquiring employment singing folksy songs and playing classical music on a restaurant’s stage. In a cozy seaside town, she seemingly finds what she has been seeking, a home in Jacqui and her son Benjamin, strangers who feel like family. Characters are fantastically real. The Great Grandmother Spirit chills the spine. The mystical Guarrangirii is a fiery, aboriginal elder. Beside Jasmine, elderly female guides plunge into the dark womb waters of the Earth. Each person who rejects Jasmine is transported back to his own tumultuous past. Old Farley recognizes himself in Jasmine, for he has pushed his wife, his children, and his parents away. The Professor has suffered great loss in the death of his beautiful wife, Hanneke, during the war and at first he fails to help young Jasmine because he is unwilling to care for a child. And Betsy Grady loses faith in humanity after the death of her beloved daughter, yet Jacqui’s strength and Jasmine’s arrival in Kirra inspire Betsy to love again. The novel’s beauty in opposites is skilfully portrayed in the following examples: Jasmine is a fair-haired beauty and Jacqui is a beauty with the black of night alive in her eyes; Johnny is a lover who longs to give all to Jasmine while Peter breaks Jasmine’s heart by being untrue; and Father Marcello is strikingly different from the native Elder Guarrangirii.